Can my car be too heavy? | What Car? 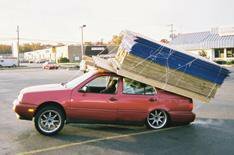 Can my car be too heavy? Q) I'm going on holiday and plan to pack my brand-new Renault Grand Scenic full of people and luggage. Is there a maximum load weight that I shouldn't exceed? A) There is; it'll be somewhere between 620kg and 698kg (depending on the exact engine and trim of your Scenic). If you're carrying suitcases and people, there's probably no need to worry even seven 12-stone adults will leave room for at least 85kgs of luggage. To find out the exact maximum load weight for you car, either check the car's handbook or log on to www.renault.co.uk. However, make sure you load the car properly for example, don't place a suitcase where it could fly forward and injure someone in an accident.